Five years ago, NorthCare Hospice, based near Kansas City, MO, announced plans to build a hospice house to better serve those with end-stage illness. The non-profit solicited fund-raising ideas and a massage therapist working for the company brought to the table a motorcycle ride. &ldquo;I came up with the idea of the ride since I&rsquo;ve been on numerous charity rides in the past,&rdquo; said Natasha Rake, who is also the event organizer and now a six year employee of NorthCare. &ldquo;I enjoy organizing these events." Ryan Trewin Memorial Poker Run May 11: The second annual ride in Clinton, OH raises money for the St. Jude Children&rsquo;s Research Hospital. See theryanride.com for more information. Bikers Against Breast Cancer May 11: Kickstands up in Pasadena, TX for their 5th annual ride and in Newark, NJ for their 8th annual ride. 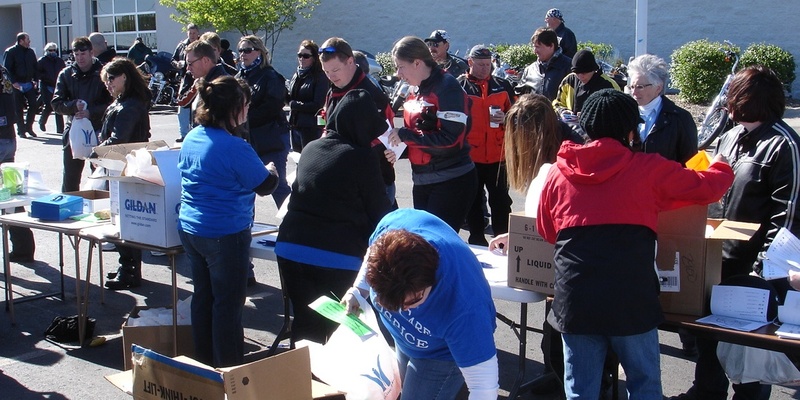 Diaper Run May 11: Proceeds from this fifth annual run in Pahrump, NV benefit the First Choice Pregnancy Center. See the Diaper Run website for more information. Rose City Oregon 500 May 11: The Rose City Motorcycle Club hosts its 40th annual Rose City Oregon 500, a 500-mile &ldquo;tour&rdquo; through the state of Oregon. For information and an entry form please click here. Howling for the Hounds May 11: The Wolves Motorcycle Club in Tucson, AZ rolls out at 11 a.m. for the 6th annual ride that benefits the Southern Arizona Humane Society. Check out the Wolves MC website for more information. Midland Motorcycle Swap Meet May 11: The 33rd annual swap meet in Midland, MI features a bike and classic car show. See their Facebook page for map and information. Spring Dart Run May 11: This ride sponsored by the VFW District 5 in Colorado Springs, CO benefits veteran charities. Register for this ride. Shop MotoSport.com for parts and accessories to prepare your bike for the road ahead! Last edited by Motosport.com; 05-07-2013 at 08:32 PM.